It is now time to continue the story of SheppyQuest Lite and Father and Son Backpacking trip Part 1. When we last left you, the brave young adventurer and his timid frightened father had camped in a random spot just off a forest service road on the way to the Wigwam Creek trail head. We woke up Saturday morning and had some granola bars for breakfast. We packed up our camp and continued along the road toward the trail head. We got to the trail head around 9AM. I have never seen the parking lot here so crowded. We got a photo of my son at the trail head. Not sure where the smoke haze was coming from. It was a bummer for scenery pictures. Last Friday while waiting to begin SheppyQuest Lite with my son, I brewed up a quick double batch of that last of my Mr. Beer HME / UME combos (see Wetta Berry Mr. Beer Batch). This afternoon, I stopped by my LHBS and picked up some raspberry puree. 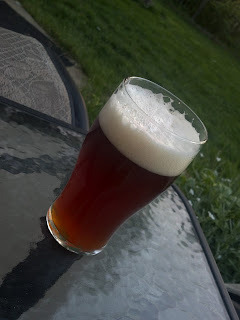 Then, tonight while the kids were reading to me, I transferred the beer from the two Mr. Beer fermentors onto the puree. "It does have an amazing ruby red color that I would love to recreate in one of my beers." It looks like now I have recreated the color. I suppose this means the raspberry flavor will be too much for me. I might end up giving away most of this beer. I'll be letting this sit on the raspberries for another couple of weeks. I will most likely let you know how the Beer Model and I like it. 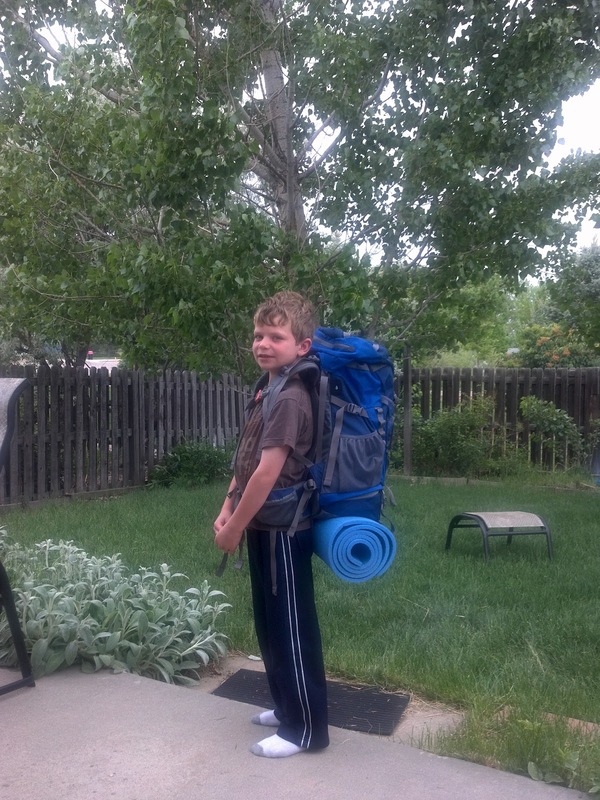 As you may remember from yesterday, my son and I were backpacking this weekend in the Lost Creek Wilderness area. It was not a very long trip, but since it was his first time, we didn't want to over-do it. He was excited. I was excited. It was an excited couple guys heading off to the wilderness. Since it would be pretty late by the time we got to the trail - head, our plan was always to camp somewhere along the way out of the mini-van on Friday night. My intention was to try to stay in Kelsey Campground, which is an actual drive-in campground along the way. We got there and all the sites had been reserved for that night. This is weird because I am sure that the reservation site says there are supposed to be two "first come first serve" campsites there. So, we had to go on. This got Connor even more excited. It meant that we would be finding a spot along one of the Pike National Forest service roads and just setting up the tent. My wife and I used to do this often, but since we've had kids we have camped in "official" camp-grounds. This whole drive-and-hope-you-can-find-a-spot-on-the side-of-the-road thing was new to him. I have had some cans of Mr. Beer HME and UME (hopped malt extract and unhopped malt extract) for quite some time. In fact I am pretty sure I have not bought my own since Peter from Mr. Beer gave me some after the 2010 GABF. A couple of the "use by" dates on these cans are coming up. So, today I had enough free time to whip up a batch of beer (a Mr. Beer batch, not a "real" batch) and decided to go ahead and use up these cans of extract. It has been a LONG time since I've done a straight Mr. Beer batch of beer, but decided I didn't want to go through the effort of coming up with anything, so my recipe is simple. I have mentioned a couple of times on this blog that SheppyBrew Brewery wants to brew a sour beer (most recently in 2012 Q1 SheppyBrew Stats). Unfortunately, I'm not quite as confident as Scott, my buddy at SNB Brewing with his Sour Ale Project. 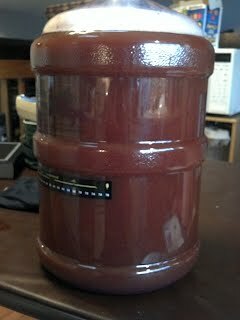 I just don't feel ready to introduce souring bugs into my fermentation process yet. So, my solution is to try a sour mash. We are pretty close to the one year anniversary of my famous Cider Drinking and Breast Flashing blog post. Remember that? 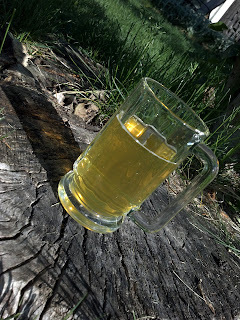 Today I found a bottle of the cider in one of my beer fridges, and decided to drink it as my New Brew Thursday drink (see just about any of my untappd articles if you need to know what that means). The cider is still not as good as my beers, but it is not too bad, and I think people who drink hard cider might like it. Maybe. I am pretty sure this is the last bottle of my "Breast Flashing Cider". I should probably make some more. This year, as far as I know, no drunk female hockey fans have pulled out breasts and flashed them to any opposing teams' players in or out of the penalty box. Of course the Canucks were knocked out in the first round of the playoffs so maybe the crazy Vancouver chicks just did not have the chance to get to it. Yes, I am pretty slutty about my beer selection. When it comes to drinking beer, I have practically zero brand loyalty. I do not even stick to similar styles of beer. My favorite thing to order at brewery tasting rooms is the sampler platter so I can try small amounts of many beers. Quite often, I'll never see those beers again. I won't even call them the next day to let them know that it is over between us. If I am having a beer when out to dinner, I always attempt to score something that I have never had before. My untappd profile confirms this. Since I have started checking beers into untappd, I have tried 130 different beers. I have mentioned before on this blog that our family has a kid-swapping arrangement with another family. They have two boys who are each within a couple of weeks in age as our two boys. Every couple months or so, our families take turns taking all four boys for a weekend. This past weekend was their turn to take all four boys. This made us sans-kids for the weekend. Of course, if you have read this blog over the past couple of days, you know that one of the things we did was brew some beer (see Brewing the Laser Salt). But we also did some other stuff. For quite some time, I've been wanting to check out Dad and Dude's Breweria. Dad and Dude's is a little brewery / pizzeria close to where I work. I've heard really good things about their pizza crust, which they make from spent grain from their brewery. Friday, I dragged my wife to the Breweria, and we were not disappointed. We did it. 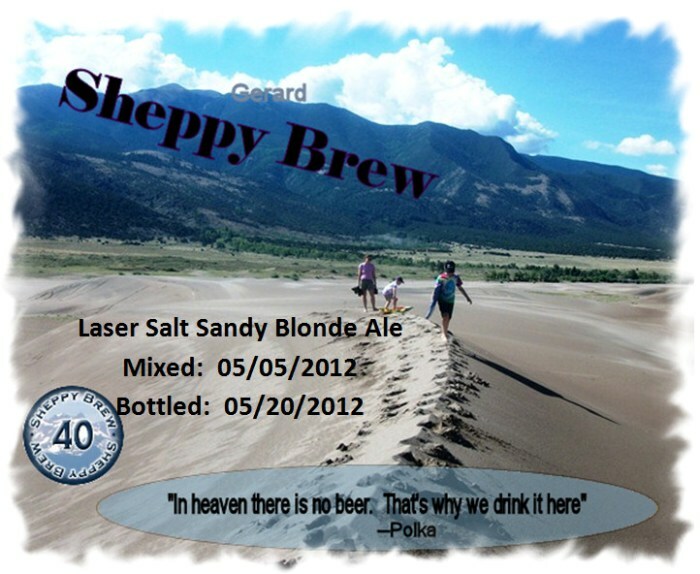 The Brew Model and I brewed up the Laser Salt Sandy Blonde Ale, just like I told you we would (see Laser Salt and The Beer Model and Laser Salt and The Beer Model Part 2 ). 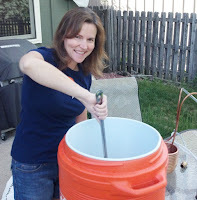 Yesterday, of course, was American Homebrewers Association's BIG BREW DAY. This has traditionally been an excuse to get the Beer Model brewing. Coincidentally, this was also a weekend that our kids were spending with the family we trade weekends with. It is nice not having to do everything on the brew day. I still have to do the lifting of the heavy hot water, and for some reason, I always get stuck with the clean-up, but at least I didn't have to do everything. When my wife (aka the SheppyBrew Beer Model) saw this video she asked me, "how did you know I would scream?" I just gave her a look and said "I just knew". We have been married a long time. So, when we last left you in part 1 of Laser Salt and the Beer Model, We had to narrow down "not too hoppy and not too dark" to an actual style of beer. We needed to do this so that we could develop a recipe. We needed the recipe to buy ingredients. We need ingredients to brew the beer. There were a couple more requirements. "Not too hoppy and not too dark". She isn't just a gorgeous face and hot body. The SheppyBrew Beer Model also brews beer once and a while. She, of course, helped me brew the first batch of 15 Year Amber Ale. I helped her brew a batch one of her favorite beers, Summer Lovin' American Wheat. (see Beer Model Brew Day). Both those beers turned out fantastic, so obviously she is a great brewer. And, let's be honest, the pictures on this blog of her brewing are much more pleasant to view than ones of the usual SheppyBrew Brew Master. She adds some tasteful class to the whole SheppyBrew Brewery persona. I am quite certain our sales would be practically nothing without her as our Beer Model and part time brewer. It was extremely close, but April again broke the number of page views on this blog. April only beat March by 2 page views. There was a slow start to page views in April. Until the very end I didn't think there was any chance of breaking the record again. It took a real strong last few days to make it. And, as I mentioned, the record was only broken by 2 page views.